Steve Reich | Will You Miss Me When I'm Gone? The band was influenced by the drones and repetition of the musical Minimalists on the scene at the time, 40 years ago, with Glass and Steve Reich at the top of the list. But imagine what having Glass himself behind the board could have done to the songs of Million and co-founder Glenn Mercer. It’s great to learn that Glass recognized their talents and declined to get in their way. GO HERE to read the full Flood interview. I have to confess that Wilco drummer Glenn Kotche‘s forays into New Music were beginning to rub me the wrong way. Maybe it was the Delta faucet commercial that set me on edge. I can’t say for sure. But it had begun to feel to me that he was trying far too hard to prove that he’s not just the drummer in one of the world’s best rock bands. He seemed to be crying out to be taken seriously as a percussionist with depth and breadth as well as great rock chops. His most recent serious album, “Adventureland” (Cantaloupe Music, 2014), is well done and pleasant, but for some reason it never really grabbed me. Maybe I just wasn’t in the right frame of mind to appreciate it. When I got the opportunity to attend a concert on Saturday in Zankel Hall at Carnegie Hall the featured some of his work, I decided to open my ears again. I’m glad I did. Kotche’s work was a big part of what made the evening a spectacular musical event. The evening opened with some older work — four selections from his 2011 Drumkit Quartets — performed by So Percussion (Eric Cha-Beach, Josh Quillen, Adam Sliwinski, and Jason Treuting) alone. So Percussion clearly had an enormous amount of fun with the compositions. All of them featured a wide array of drums and myriad other percussion. The first, “Drumkit Quartet #50 (Leffinge, Chicago), kicked off with each member of the ensemble playing a hand-cranked siren, while the third, “Drumkit Quartet #51 (Tokyo, Brisbane, Berlin),” featured Japanese rock band Cibo Matto‘s Yuka Honda (who is married to Wilco guitarist Nels Cline) reciting haiku. It’s no surprise that So Percussion knew the pieces well, as the ensemble has recorded a “Drumkit Quartets” album due out Feb. 26 on Cantaloupe. Kotche joined the ensemble for the world premiere of “Migrations,” a Carnegie Hall commission, that testified dramatically to Kotche’s admiration for minimalist composer Steve Reich with rhythms playfully produced on marimbas struck with fingertips and combs. A hard-driving “Drumkit Quartet #1,” featuring a strobe-like animated film by Patrick Burns, closed the Kotche section of the show in memorable fashion. The evening also featured a short piece by composer Steven Mackey, “Before It Is Time,” sung by Shara Worden, a performer and composer who works in rock and New Music like Kotche. (She performs in the rock world as My Brightest Diamond), in its New York premiere. A 45-minute Worden song cycle, “Timeline” — commissioned jointly by Carnegie Hall and the University of Texas at Austin — closed out the evening. Worden sang and, at times played the guitar, a distracting move that took the focus off of the rhythms and interesting tonal qualities of the percussion, which included a mean steel drum number played by Quillen. We at Will You Miss Me When I’m Gone? have a soft spot for percussion music and the ensembles that play it well. So it should be no surprise that we’re excited about the Yale Percussion Group’s visit to New York on Sunday, Dec. 12. This exciting group of performers — Michael Compitello, John Corkill, Ian Rosenbaum, Yun-Chiu Candy Chiu, Leonardo Gorosito and Adam Rosenblatt, directed by founder Robert van Sice — will be bringing four major percussion classics to the stage of Zankel Hall at Carnegie Hall. Included is Mauricio Kagel’s rarely performed Dressur to the Balinese-flavored mysticism in James Wood’s Village Burial With Fire. Add to that Thierry de Mey’s Musique des Tables, played on amplified table, which is as much fun to watch as it is to hear and top it off with Steve Reich’s Sextet, and you’ve got a great evening of percussion music performed by top-notch players. If you need proof, check out performance videos of YPG at work by clicking here. Boosey & Hawkes, Steve Reich’s publisher, is running a contest for free tickets. You have until 2 p.m. on Friday, Dec. 10, to enter. Click here to enter. If you don’t win, read on for ticket-buying information. 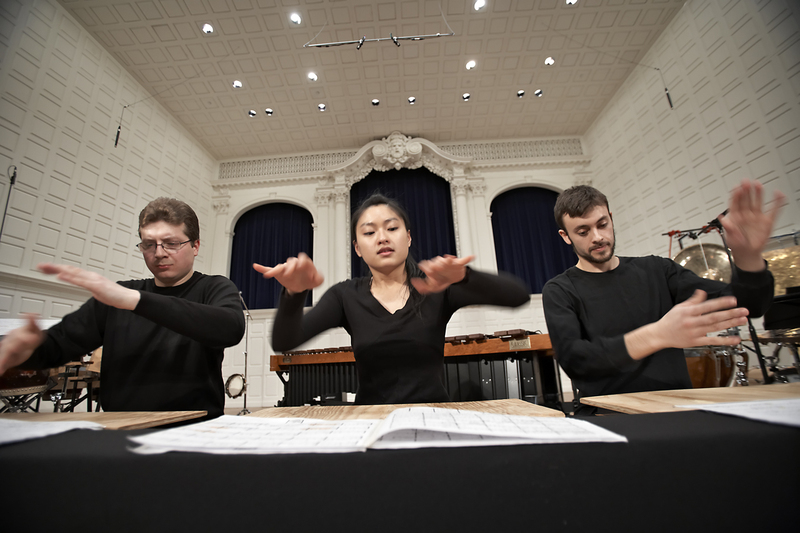 musand Yale Percussion Group performs at 8 p.m. Sunday, Dec. 12. Zankel Hall at Carnegie Hall, Seventh Avenue at 57th Street, Manhattan. Tickets, which are $15-25, are available at the box office or by clicking here. I saw and heard the future of New Music on Sunday night, and I am happy to report the future is bright. A saxophone solo opens the performance of "In C."
Radio Lab host Jad Abumrad was master of ceremonies. Riley’s piece is more of a challenge than Reich’s because it is less structured, more mutable and highly shaped by the musical personality of the performers. The 15 talented players in GVSUNME — most of them students — played an engaging version that they made their own with the use of electronics and flourishes like a saxophone solo to open the performance. Sunday’s concert was a celebration of the release of In C Remixed, GVSUNME’s double-CD recording of In C and 18 remixes by 16 artists. The ensemble’s recording of “In C” clocks in at just over 20 minutes. For Sunday’s concert, the group played for about an hour. That’s the other major variable of the piece — it’s written in such a way that it can be as long or short, within certain limits, as the players want it to be. Grand Valley State University New Music Ensemble at (Le) Poisson Rouge in NYC. The Grand Valley State University New Music Ensemble — the group that made the splendid recording of Steve Reich‘s Music for 18 Musicians in 2007 — is at it again. This time the group has commissioned a bunch of artists to record, remix and reinvent Terry Riley‘s seminal work, In C.
You can get a taste of what they’re up to by checking out the project’s web site, which was launched today. In this project, a slew of invited artists took GVSUNME’s recording of In C and remixed it to create their own version. The only rule was to produce a 4- to 8-minute track. Contributors include: Jad Abumrad, Masonic (Mason Bates), Jack Dangers, Dennis DeSantis, R. Luke DuBois, Mikael Karlsson/Rob Stephenson, Zoë Keating, Phil Kline, Kleerup, Glenn Kotche, David Lang, Michael Lowenstern, DJ Spooky That Subliminal Kid, Nico Muhly, Todd Reynolds, and Daniel Bernard Roumain (DBR). Their versions are being assembled into a album, In C Remixed, due out digitally on Oct. 27 and on CD on Nov. 17. It’s available for preorder here. The ensemble is also performing the reinventions live, and will bring the show to NYC’s (Le) Poisson Rouge on Sunday evening, Nov. 8. $15. Signal has existed for little over a year. But in that time, the flexible New Music ensemble has developed a reputation as one of the finest interpreters of the canon. The group skillfully tackles the music of many of today’s greatest composers, but it’s closely identified with the work of Steve Reich — partly because composer-conductor Brad Lubman, one of Signal’s two co-founders, has long been associated with Steve and the Steve Reich Ensemble. Signal had the honor of being the first ensemble other than eighth blackbird to play Steve’s Pulitzer Prize-winning Double Sextet. It was an honor because eighth blackbird commissioned the piece and has control over who else can perform it. Signal did such a fine job with the piece, clearly illustrating its strong connections with Steve’s work — that I started wondering how long it would take before Signal would get its own piece from Steve. I asked Signal’s other co-founder, cellist Lauren Radnofsky, that question, and was thrilled to learn that we were on the same page: a commission was in the works. Because the commission involved a Meet the Composer grant and a co-commissioner, the news had to stay under wraps until everything was nailed down. With today’s announcement of MTC’s grants, it’s no longer a secret. Signal performing at (Le) Poisson Rouge. Q: How did Signal’s Steve Reich commission come about? A: It was an idea we thought of early on, after Signal formed. We love his music, so it seemed that he’d be the first and most obvious person to ask, especially given everyone’s association with him and his music — especially Brad, who has worked with Steve and premiered a number of his pieces over the last 14 years. Q: What are the parameters of the piece? Is there a subject, context, or idea that you guys suggested, or is he totally on his own? A: He’s totally on his own. Q: Is there a title? Q: What’s the process? Is it collaborative or will Steve write and you guys will play it? A: He writes, we play! Q: Is he writing for a specific configuration of the group? A: The exact instrumentation is not yet determined, but the piece will be for approximately 20 players. Q: You describe it as a co-commission. A: The other co-commissioner is MITO/Settembre Musica in Italy. Q: How excited are you guys about this? A: YEAH!!!!!!!!!!!!!!!!!! We couldn’t be more excited!!!!!!!!! Q: When will it be premiered? A: The premiere will be during the 2011-12 concert season. Q: What are your plans for the work? A: We’re working to plan tours in Europe, Asia, and the U.S. We would record the piece at a later date. If you’re a true Strange Freak — a fan of Stew, Heidi Rodewald and their extended theater family from the musical Passing Strange — you already know that Stew and Heidi aren’t resting on the laurels they received for that show. They have a new project in the works slated for a short run next February at St. Ann’s Warehouse, the arts center in the DUMBO section of Brooklyn. Heidi Rodewald greets fans outside the Belasco Theatre. But early this morning Will You Miss Me When I’m Gone? exclusively revealed that the prestigious arts-funding organization Meet the Composer‘s grant program for 2009 includes an award to Stew and St. Ann’s for the show, called Making It. This is not their next play, which has commitments from The Public Theater in Manhattan. It’s a multi-media rock-show presentation (something that should seem familiar to anyone who’s seen Passing Strange) featuring a collage of song, text, and video tracing “the unlikely careers of Stew and Heidi from the dive rock clubs of Hollywood to the footlights of Broadway — with Stew as your helpful guide to Making It,” according to the St. Ann’s web site. Meet the Composer today announced a slate of $450,000 in grants to 61 composers, performers and arts presenters. The the majority of the grant-winners are from the classical side of the contemporary music world. So it’s truly gratifying to see Stew, a remarkable talent from the pop world, recognized alongside composers like Steve Reich, John Harbison, David Lang and Julia Wolfe. Tickets are available to St. Ann’s members now, and go on sale to the general public on Sept. 2. 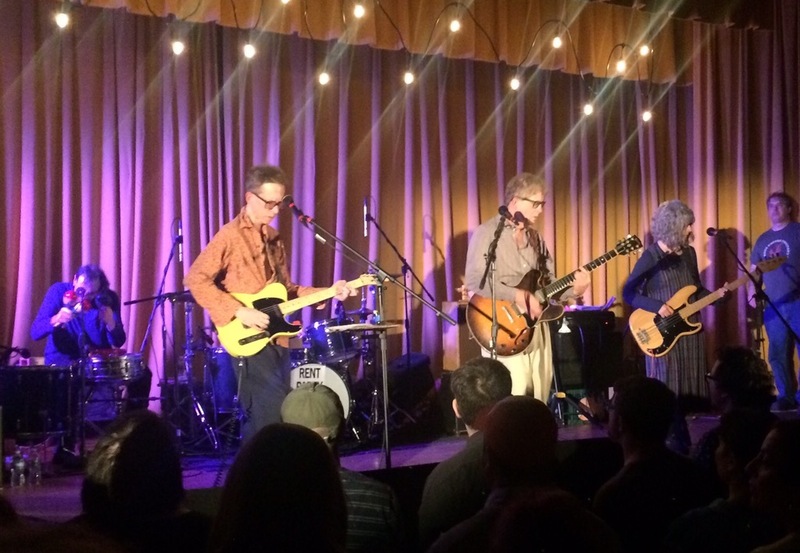 Click here to join St. Ann’s online and get immediate access to tickets for all of the upcoming shows there. Congratulations to Stew and St. Ann’s!